The following features distinguish Argentine ants from other species present in New Zealand. 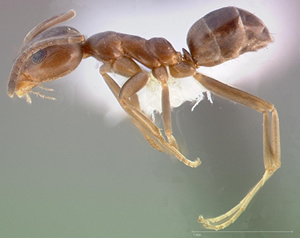 Upper and rear faces of the propodeum equal in length (to distinguish from Doleromyrma darwiniana; Darwin's ant). There is no absolute feature that can solely identify Argentine ants in the field. The below features are helpful, but some other ant species also possess these. Workers are about 2–3 mm long and a uniform light-brown colour (compared with the common black species found foraging in urban areas in New Zealand). The ants move quite fast (not ponderous). They have only a slight greasy odour when crushed, as opposed to the strong formic acid smell of some ant species.